Discussion in 'Our Products & Services' started by Cyber, May 26, 2017. Versions of extender: unlimited, limited (400 players), test. Popular functional: Autoloot, exp on/off, offline trade. In extender included: NPC buffer with profiles, profession manager, GMshop. AdvExt High Five is the leading product of our extenders! 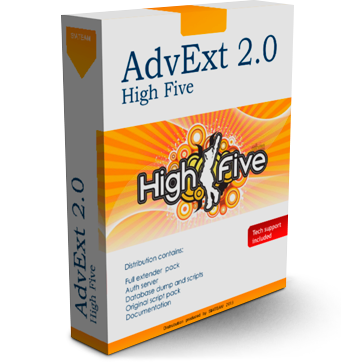 AdvExt High Five is a is a fully functioning High Five server based on the original Gracia Final PTS server core and Freya scripts pack extended to the High Five part 5. It has a lot of additions, faster functional and mechanics that make your server way more flexible to set any kind of task. AdvExt High Five is a result of a mixture between retail files and a set of AdvExt additions that allows you to create interesting and unique game projects. It is also being constantly fixed and updated in order to provide a quality service on the game market. Flexible Autoloot system (monsters, raid bosses, player killers etc). Comfortable system that allows you to control any kind of chat (shout, private, trade, hero etc) in order to prevent it from flood and spam. Ability to enable pvp counter for battle grounds (i.e. sieges). Flexible Olympiad system that will help you prevent any kind of exploit. Pvp reward system with a built-in exploit protection system. Boost Rate event – an event that allows you to boost servers rates for a fixed amount of time. Ability to limit the amount of flags that one clan could have in order to avoid a imbalance in power. Ability to change the limit of levels on a main and sub-class. Ability to disable AOE skills for alliance members. Ability to turn off the player killer penalty. Ability to apply any kind of changes without full reboot. By purchasing AdvExt High Five you are acquiring a set of components. Pay your attention to the minimum equipment requirements for the AdvExt products.